Its that simple, it was amazing its like the best KFC you have ever had. 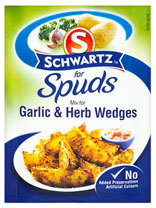 She also made a gorgeous simple salad with roasted potato wedges coated in "Schwartz Garlic Spuds" displayed below which were actually lovely in comparison to other wedges you can buy frozen. The meal was excellent and she constantly tells me she cant cook its all flipping lies , this chicken was literally finger licking good.